Would you pay for a $149 dongle? Halloween has passed, but Essential hath risen from near death to deliver unto us a $150 dongle. Audiophiles who also happen to own an Essential phone, now is the time to rejoice—if you’re actually out there. 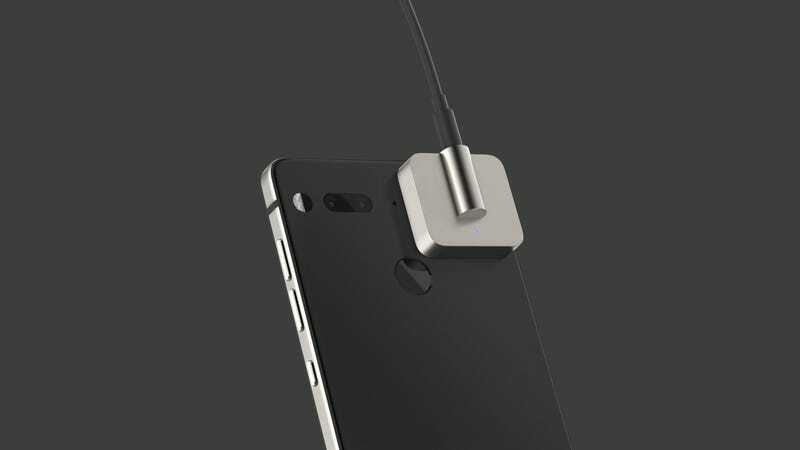 The dongle, available now in the U.S. and Canada, is called the Audio Adapter HD and attaches magnetically to the back of the PH-1, and uses MQA rendering to deliver better-quality music. Oh, and a three-month trial subscription to Tidal. Tidal is the only streaming service that actually supports high-fidelity MQA rendering, so when you think about it, yeah it scans that would be Essential’s partner of choice. But Essential itself is not doing very well, and there’s a lot of reasons why it seems it has one foot in the metaphorical grave. From the start, the smartphone that was supposed to change it all was plagued by delays. Botched orders and buggy launch-day software cemented its status as one of tech’s most bizarre sagas. Even after lowering the price of its PH-1 phone, Essential never really recovered from its initial growing pains (though we do find the phone to be a pretty great buy now). The recent sexual misconduct controversy swirling around co-founder Andy Rubin, its canceled plans for a second phone, and rumors that the company is up for sale haven’t necessarily helped either. Even the dongle has had its own mishaps. Initially, it was announced in September 2017 and supposed to start shipping this summer. Obviously, that did not happen. Still, the $150 dongle ($150!!!) for a phone that reportedly sold fewer than 90,000 units may not be Essential’s last gasp. After scrapping its second-gen phone, Essential is reportedly working on an AI-powered companion device for smartphones. Whether it sees the light of day... who can say. But hey, at the very least Essential kept its promise with the dongle. How Much Would You Actually Pay For an Essential Phone?